Triphala is known to reduce the risk of heart attack. It is known to control the level of cholesterol in our body. 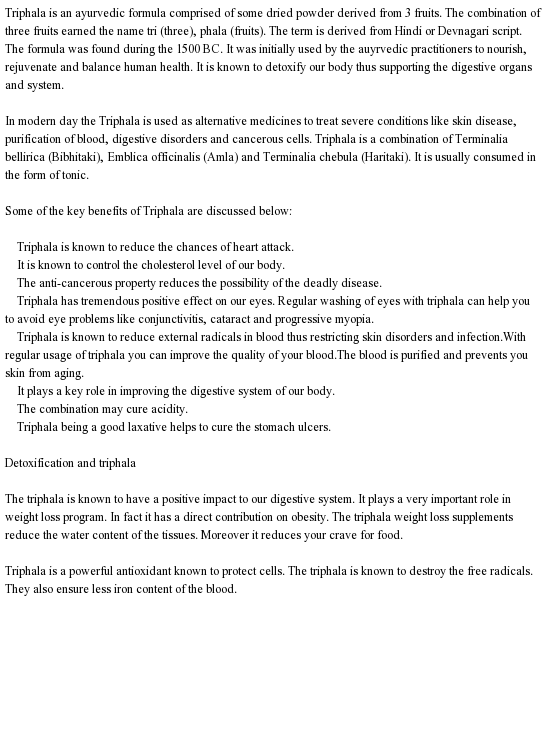 Triphala has a significant positive effect on our eyes . Regular washing of the eyes with triphala can help prevent eye problems such as conjunctivitis , cataracts and progressive myopia . It plays a vital role in improving the digestive system of our body . This entry was posted in triphala, triphala weight loss, weight loss and tagged triphala, triphala weight loss, weight loss on December 31, 2013 by chrissjonss.